Yes spring is on its way, well some days it feels like summer, then the following day the rain keeps pouring but I just want to believe spring is coming (never under estimate the power of denial), so I am starting to eat and experiment more salads dishes to get in that mood..but to be honest, it’s especially because my diet has been lacking raw leaves lately. As much as I love San Francisco, I miss the four seasons, and not the two seasons of summer and winter like in some areas of the East Coast. The four seasons with four different climates, therefore a more gradual change of vegetation and variation of garde-robe (wardrobe). Here you go from wearing boots to wearing sandals, which is somehow radical, there is no springs clothes. It makes things easy at least. This salad is not necessary “springy” nor “summery” since it doesn’t have any seasonal vegetables, but it’s very fresh and has a great combination of textures. The addition of edamame in salads is always a big pleasure, their delicate crunchy bites is delightful, and more so with a ginger-lime vinaigrette. I love to use avocado oil when combined with ginger, it’s as fruity as olive oil but not as strong and enhances the dressing without drowning the dish due to the powerful flavor of the ginger. The other characteristic of this salad is that the shrimps and langoustines are mixed with the spinach while hot, so the spinach leaves get entangled with the seafood and become semi-cooked and lukewarm, therefore absorb the vinaigrette much better. Lukewarm spinach salads are my favorites. For the vinaigrette, mix lime juice, avocado oil, ginger, cayenne, salt and pepper in a bowl. Stir all ingredients well. Saute shrimps and langoustines tales in hot olive oil, add salt and pepper. Drain olive oil. 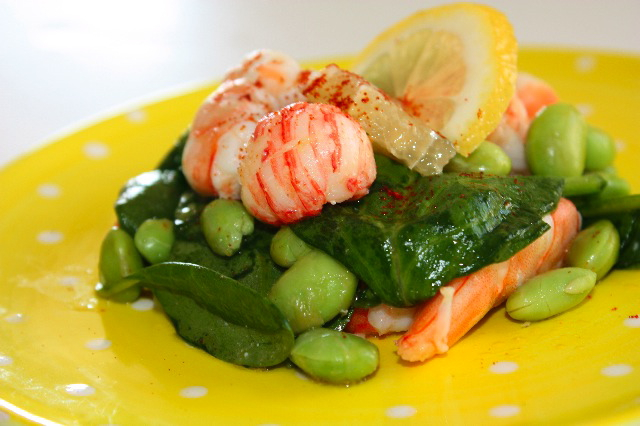 Mix edamame with spinach, add hot seafood to the spinach and vinaigrette. Toss well and serve. This entry was posted by silvia on March 13, 2010 at 8:20 am, and is filed under Salads. Follow any responses to this post through RSS 2.0.You can leave a response or trackback from your own site. I will have to try this version of a wilted salad. Delicious with the seafood component and a meal in itself. spinach and seafood,very clever combination!and the salad looks so good!i wish you a wonderful week-end! looks lovely! beautiful shrimp. and yes, the east coast has two seasons at best – very hot or very cold. it’s all the humidity. Lovely idea to mix the langoustines with the spinach when still warm. I am a four-season kind of girl, too – Spring and Fall are my favorite and I always feel cheated when the weather changes from cold to hot too quickly. I used to expect whatever weather is coming ahead…But our planet is quite sick right now! Most of the time, things just happened! Just think about the plus & minus 2 degree in our planet.=( Whatever so! Your salad looks truly delicious. yummm…. EAT first and then think about it! I love warm spinach as well. I love spring, and this really is spring in a dish! Lots of ginger in this–so nice with the edamame! The rainy season in SF can be very long…I remember it well. It’s the blue sky sunny days that make up for the days with gray. The colours are so intense and so fresh. I love to try langoustines one day. They do not have them here. What a lovely shrimp salad. I was just thinking of making my famous shrimp salad today! Super super beautiful pictures. I love ginger so this is definitly a recipe that would fit my tastebuds very well. Come and check out when I’m making Swedish meatballs on my cooking show! Love this combination – those colors!! This is my kind of dish. Simple yet flavorful and delicious. Beautiful ingredients. The langoustines look immaculate. ANOTHER AMAZING DISH!!!! And, yes, my daughter loved it again, including the spinach – which she does eat regularly but she went crazy for it in this dish.